Showcase deer in your home in a new and exciting way with these Esschert Design Aged Brown Cast Iron Deer and Antlers Wall Hooks. These two different hangers perfectly complement each other, thanks to their distressed brown tones, cast iron construction, and common motif. A recognizable buck’s head on a plaque shape creates the Deer Wall Hook, and two arms extend from the base of the plaque for holding a jacket or bag. The eyes of the buck seem to gaze outward, adding an intense look, and his generous antlers complete the piece. This element perfectly matches the Antler Wall Hook, for a fantastic theme in your entryway. The slight upward arc of this hanger adds realism to it, while its outwardly extending rods create hanging spots. These are perfect for holding keys or a dog leash, and the deep brown hue offers a rustic hint. Predrilled holes on the back of each hanger make them simple to affix to your wall, and their cast iron construction remains durable and beautiful for several seasons. 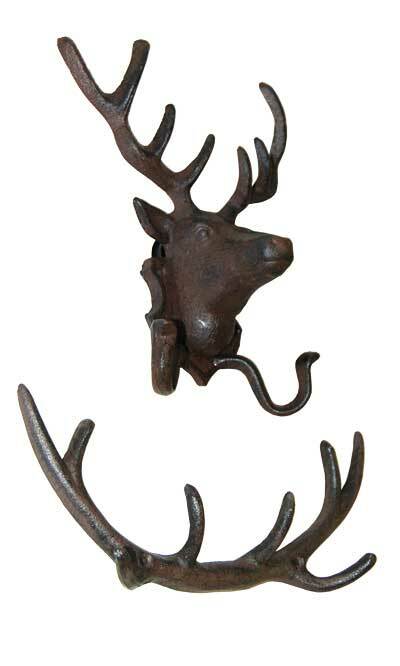 Create a welcoming lodge theme in your home with these Aged Brown Cast Iron Deer and Antlers Wall Hooks. Qty 1 Esschert Design Cast Iron Deer Wall Hook, Aged Brown, 10"
Qty 1 Esschert Design Cast Iron Antler Wall Hook, Aged Brown, 11"
Esschert Design Cast Iron Deer Wall Hook, Aged Brown, 10"
Esschert Design Cast Iron Antler Wall Hook, Aged Brown, 11"
Whitehall Oak Leaf Nature Hook, Oil Rub Bronze, 15.25"